Q: What fonts are available for East Cree and where can I get them? Please follow this link for a list of all available fonts. Q: I have installed my East Cree fonts but Internet Explorer still shows ‘`??? ?’ How do I fix that? To display Cree syllabics correctly in Internet Explorer 7, follow these steps. First, go to “Internet Options” under the “Tools” menu. Now click on “Fonts” (near the bottom, under “Appearance”). A new menu will appear. In this one, go to where it says “Language script” and choose “Canadian Syllabic”. Now select “BJCree UNI” under “Webpage font”. Click “OK” in the Fonts menu, and then “OK” again in the options menu. The syllabics should now work. How do I convert syllabics to Roman spelling, or from Roman spelling to Syllabics? You do this on a Windows PC running MS Word. You need the utility in the “Cree Roman VBA Template” which is found in CreeKeysPRO (also known as Keyman, which can be downloaded here for Mac and here for PC computers). Copy this template to your Word “Startup” folder, and then open your file in Word. Under “Tools” use the menu item under “Cree Syllabics Text Tools.” Syllabics are converted to Roman formatted in “Courier New” font. Roman (in “Courier New” font) can be converted to syllabics. If your text is on a Mac, first convert it to Windows (see How do I convert syllabics between Macintosh and Windows?). If you can do this, you already have the utility you need to do the conversion, in “Unicode Cree Roman VBA Template”. Please refer to the How-To Videos to see how this is all done. How do I convert Legacy encoded texts to Unicode? You do this on a Windows PC running MS Word. You need the utility in the “Cree Roman VBA Template” which is found in CreeKeysPRO (also known as Keyman, which can be downloaded here for Mac and here for PC computers). Copy this template to your Word “Startup” folder, and then open your file in Word. Under “Tools” use the menu item under “Cree – Unicode”. Syllabics are converted to Unicode and formatted in the “BJCree UNI” font. Unicode can also be converted back to the 8-bit BJECree “Legacy” encoding. If your text is on a Mac, first convert it to Windows (see How do I convert syllabics between Macintosh and Windows?). To do this you need “Unicode Cree Roman VBA Template”. How do I create a PDF file with Syllabics? How do I type in Cree Syllabic Symbols on my computer? Which Cree fonts should I use? This depends on the computer and operating system you are using. The best choice is Unicode, but not everyone has equipment and software that will support Unicode. The following chart should help you decide. When using Syllabics, users must manually select the font “BJCree Uni”, otherwise the programs will default to another font and this can result in problems. Even if the syllabics do appear, the orientations can be faulty if BJCree Uni is not selected. The following were last verified in 2002. 1. Operation systems (OS) built after 2002 include support for both Unicode and non-Unicode fonts and the same can be said for most modern programs. For Word, Internet Explorer, Outlook Express and other Unicode-aware applications, you can use the Unicode BJCree UNI font and keyboard. CreeKeysPRO comes with utilities that run with Microsoft Word to convert texts between the 8-bit and the Unicode encoding. 2. Since 2002, there has been support for users who need an input method for syllabics on Mac OS X: Mac OS X 10.2 (and higher) adds the ability to install a new keyboard layout by putting a file or bundle in a standard folder. It is also now possible to define a Unicode keyboard via an XML text file. We have explored this capability successfully this is now our recommended method of keyboarding syllabics on a Mac. If you must use an older Mac and you need to input Cree syllabics, you can install McCree2. It is also possible to convert Cree texts in order to view these texts on Mac OS X. This would be the preferred encoding for archiving and Internet use in any case. Mac OS X can use BJCree UNI and other Unicode syllabic fonts natively: The same TrueType Unicode font file that is used on Windows PCs can also be used on Mac OS X, and (once we figure out how) Mac OS X 10.2 “Jaguar” will allow you to keyboard directly into Cree syllabics in Unicode. 3. There is no CreeKeys “package” for Windows 3.1. Instead, you have to install and configure Keyman 3.2, the font files, the keyboard layout, and the shortcuts “by hand”. There are detailed instructions, but it is not for beginning computer users. Maybe you can get someone to install it for you. Once it is installed, using the font/keyboard is easy. 4. Worthwhile linguistics software applications are either being re-written to support Unicode, or new applications with similar capablities are being developed that are Unicode compliant. Notable examples are Paratext 6, a Unicode compliant version of Paratext, and Toolbox 6, a Unicode version of Shoebox, the popular text analysis and lexicography program. How do I install Cree fonts and keyboards to use in my computer? Note that in Windows 2000, XP and Vista you need to be logged on with “Administrator privileges” to install programs and fonts anyway. For best results, read the instructions included in the package in a file named CREEKEYSUNI. To install CreeKeys (for Windows 3.1 and below) or McCree (for Macintosh OS 8 or 9 and below) contact us (admin@eastcree.org). Why are my syllabics not showing up properly? A universal set of characters paired with a code, as a way of represent all the various characters found in all written languages. In order to address the interchange of texts across platforms, as well as to provide the number of characters required by the languages of the world, a “two-byte” encoding standard called Unicode was developed. This standard provides a discrete computer character code for virtually every character in every language in the world. One block of the Unicode encoding system was set aside for Canadian Aboriginal Syllabics. This block contains the standard codes for over 600 characters, including Cree, Naskapi, Nunavik, Blackfoot and Carrier. These characters are in the range U+1401 to U+1676 in the Unified Canadian Aboriginal Syllabics (UCAS) block of Unicode version 3.0. Both Windows and Macintosh operating systems have taken steps in the late 1990s toward implementing Unicode, but unfortunately at the time of this writing (c. 2002) that implementation is not yet complete. It is clear, however, that the industry is moving toward embracing the Unicode standard in the near future. Since many difficulties associated with Legacy encodings can be avoided by using Unicode, users should install and use Unicode syllabics if their equipment and application software can support it. The only drawback to using the Unicode encoding system for syllabics is that some older systems and software programs do not support it, so material must be converted between Legacy encodings and Unicode. What do you mean by ‘Legacy’ syllabic fonts or encodings? Legacy means “handed down from the past”. In computer jargon, it refers to technology that was developed in the past, still in use, but has been superceded by more advanced technology. With regard to fonts and encodings, it refers to any computer fonts that have non-standard character encodings. There are many of these that contribute to the confusion and difficulty when attempting to move multi-lingual texts between applications and computer platforms. The BJECree encoding is but one example of many legacy encodings. Because of earlier limitations in the technology, developers were forced to create fonts that replaced some character shapes with other shapes according to the needs of a particular language project. 7-bit and 8-bit syllabic encodings are referred to as “Legacy” encodings. What do you mean by ‘7-bit’ syllabic fonts or encodings? When a 7-bit encoding is used for Cree syllabics, the typewriter keys are made to correspond to syllabic characters. While they can be used without any special keyboard programs, a unique “Cree” keyboard layout must be learned in order to type these characters. One benefit to this approach is that users across many programs and platforms are able to share texts, even over the Internet, provided that a font with a matching encoding is used on each computer. It is possible to design a 7-bit font that works on both platforms, but it pushes the limit of the character inventory. Some drawbacks to the 7-bit approach is the limitation on the number of characters in the character set, the necessity of learning a new keyboard layout, and the many different (conflicting or competing) 7-bit encodings in use. We do not recommend using any 7-bit encodings unless you already use your own and like it. What do you mean by ‘8-bit’ syllabic fonts or encodings? 8-bit refers to the characters that are represented (for the most part) by the characters on the keys of a standard typewriter or computer keyboard, including A-Z, a-z and 1-0, along with a standard set of “accented” and symbol characters. The practical limit to the number of characters in an 8-bit character encoding is about 122. However, in practice 8-bit encodings tend to leave the 7-bit characters (A-Z, a-z etc.) as they are and only re-assign decimal 128 to 255 to syllabics. The obvious benefit to this approach is that standard alpha-numeric (English) characters are available in the same font as syllabic characters: English words can be incorporated in Cree texts without changing fonts. However a keyboarding program must be used in order to conveniently access the syllabic characters in such a font. Such programs have been in use for some time, two important ones being Tavultesoft Keyman for Windows and SILKey for Macintosh. By implementing such programs, custom keyboard layouts of any configuration may be used, even multiple keyboard layouts for the same encoding. Some drawbacks to the 8-bit approach is still the limitation on the number of characters in the character set, application software and printer drivers interpreting certain characters differently, the incompatible encoding standards of Macintosh and Windows, and the different (conflicting or competing) 8-bit encodings in use. Alas, with 8-bit legacy fonts Mac and Windows must use different encoding schemes. What about other syllabic fonts and encodings? There must be dozens of “Legacy” syllabic fonts out there. It seems that whenever someone needed a font they invented their own way to do it. Even the CreeKeys and McCree Legacy 8-bit fonts are still “hacked” fonts, where existing standardized fonts were forced to do syllabics. These were both based on earlier fonts, so that there would be some backward compatibility. The East Cree School Board used a set of extended 7-bit fonts created by Eiko Emori in the late 1980s and early 90s that were replaced by BJECree, which shared the encoding of SILECree. Conversion programs were written so that the old texts typed on the Eiko Emori fonts could be converted to the BJECree encoding, and later to Unicode. If you are using any syllabic typing system that is satisfactory to you on your current equipment, there is no need to change. 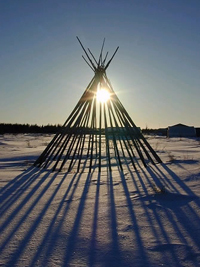 But if you are interested in sharing Cree text files between computers or over the Internet, it is important that your system will handle this. Unicode was written to do this job, and should be considered by any Cree syllabic project that aspires to share texts beyond their own community or organization. Being able to convert texts from older “Legacy” encodings to Unicode (and possibly back again) will permit a transition stage where material may be produced on one kind of computer, and then posted on the Web on another. Seriously considering and implementing Unicode will avoid lots of problems inherent in other encoding systems. Sometimes when I work with tables in MSWord, I cannot see the dots in the syllabics, but when I print the document they are there. Use the zoom feature in the standard toolbar. At 150% you should see all the dots that are there. Or, use a larger font size. Why do other syllabics characters appear between words that I did not type? You probably have the “Reveal Formatting” to show formatting marks, such as paragraph marks and tabs feature turned on. This feature is not compatible with (Legacy) Cree syllabics. Unclick the ¶ button on the toolbar (shortcut key CTRL + *). Or click on Tools-Options-View menu; unclick all the check marks under “Formatting”. Really want to know why? The BJECree (Legacy) encoding uses the “paragraph mark” character and other “symbol” characters for syllabic characters instead. When you reveal these characters, you get the syllabic character that was assigned to that code instead. This problem goes away if you can use Unicode. In Word for Mac 2011, some fonts disappear when I try to make corrections to the syllabics. The previous character gets deleted. What can I do? 1) Write the correct word down elsewhere in a blank space in your document. Then, copy the word, and paste it over the incorrect word. 2) Use the paid version of Keyman. I type the right characters in syllabics, the syllabic characters mysteriously change to something else as I type. Click on Tools-AutoCorrect, select the “AutoFormat as you type” tab, and deselect everything. Also select the “AutoCorrect” tab, and deselect everything there too. These features corrupt (Legacy) Cree syllabics typing and should never be left on. This will solve the /wii/-apostrophe problem for example. Really want to know why? The BJECree (Legacy) encoding uses upper and lower case accented characters for syllabic characters instead. The AutoCorrect and AutoFormat options try to correct your “capitalization”, and changes the syllabic characters unexpectedly. This problem goes away if you can use Unicode. I try to type in syllabics, but I get weird characters instead, like �5��¶. The first thing you need to do: Make sure your Keyman is turned on. Then, you need to select the right syllabic font. Click on Format-Font, and choose BJCree Uni if your document is Unicode, and BJECree for non-unicode documents. Make sure that your keyboard matches the font. Note: You are strongly advised to use the unicode version. selected. You need both the Cree font and Cree keyboard to type in Cree. This can also happen if you mix unicode with non-unicode in keyboards and fonts. The first thing you need to do: Make sure your Keyman is turned on. Then, you need to select the right syllabic font. Click on Format-Font, and choose BJCree Uni if your document is Unicode, and BJECree for non-unicode documents. Make sure that your keyboard matches the font. When Keyman is on and a keyboard is active, the Keyman Icon will appear as . Really want to know why? The BJECree (Legacy) encoding retains all the plain English characters along with the syllabic characters. I want to put Cree on the Internet, what do I do? Unicode is the most reliable way to display syllabics on the Web. You can use any method to produce the Cree text, depending on what you have available (see Which Cree fonts should I use?) and then you can convert the text to Unicode before pasting it into your Web editing tool. (see Converting Legacy encoded texts to Unicode). You will need a Web page designing program (such as Dreamweaver) or Integrated Development Editor (IDE, such as Aptana) or a text editor (such as Notepad++) that is Unicode aware. You must also save your html files as (Unicode) UTF-8, and set your browser to (Unicode) UTF-8 encoding or character coding. I want to browse a web page that has Unicode Cree syllabics, but they do not show up on my screen. First make sure that your Operating System is Unicode compatible (see table above), and that your browser is (see table below). Then make sure that you have downloaded and installed the Unicode Cree font you want to see. To do the latter, go to eastcree.org or the creeculture.ca web sites where the fonts can be downloaded. Why can’t I use a Legacy encoding on the Web? You can, but it is perilous. First of all, most of the Legacy encodings out there have one or two characters that is “illegal” in certain important applications. The CreeKeys font, 8-bit BJECree, as currently distributed, has a problem with the /maa/ character, at decimal d173, the character code for “discretionary hyphen”. In many applications, this character is a “zero-width” character so it does not show. A new 8-bit BJECree font has been developed with /maa/ re-encoded to another character code, and it works. However, to re-deploy the “new” BJECree font is a major undertaking, because everybody would have to do it for all the documents they have in the old font. The 8-bit East Cree BJMac font for Macintosh in the “McCree” package also has several drawbacks, notably the “illegal” Mac character code at d202 for the /taa/ character. A new edition of this font has also been produced for a work-around, but we face the same re-deployment difficulties. Even with the improved fonts, any text published to the Web would have to use some software strategy to “convert” the encoding Cree texts “on the fly” for the different client computers, Mac or Windows. Or different versions of each web page have to be deployed for each OS. 7-bit Legacy fonts have been used with some success to put syllabics on the web, notably for some Inuktitut language sites (see What do you mean by ‘7-bit’ syllabic fonts or encodings?) but for most Cree language sites a larger inventory of syllabics is required, and a strictly “7-bit” approach can seldom be maintained: Certain character codes must also be used from the 8-bit range. Also, users of this approach are switching to Unicode. Can I send and receive E-mail in syllabics? You can. As usual, Unicode is the best approach. But you need a Unicode-aware e-mail client. You install CreeKeysPRO, use the BJCree UNI keyboard. Remember both the sender and receiver each need a Unicode compliant installation. You can also use a Legacy (8-bit or 7-bit), but it is perilous. See the problems listed under Why can’t I use a Legacy encoding on the Web? Can I “chat” using instant messaging in syllabics? You can. As usual, Unicode is the best approach. But you need a Unicode-aware messaging client. Remember both the sender and receiver each need a Unicode compliant installation with fonts. Also, note that if you have the option of selecting a font in your chat messenger, do so, otherwise certain syllabic characters’ orientations might be off. You can also use a Legacy (8-bit or 7-bit), but it is perilous. Can I use syllabics on Twitter and Facebook? The answer is yes, but not everyone will be able to see it. The users on the other end must also have the BJCree Uni Font installed and configured. Also, Facebook and Twitter do not assign BJCree Uni font as default, just because you’re typing in syllabics. You can increase your chances of success by following the steps outlined here. How can I create web pages with Cree Syllabics that do not require users to download a font?